God desires to pour in us a solid foundation of truth so that we might build our lives well. In sports, understanding principles is more important than learning plays. In the kingdom of God, the Lord develops our being before he requires our doing. The United States is an unfortunate example of a people who have forgotten and/or forsaken principles. Some churches have lost their way too, wandering from foundational principles of the Bible. They tell people the plays for living the Christian life, but their theology is weak. We must all be principled, anchored in truth. Jesus did not come to abolish the Law or the Prophets. 1) The moral law: The 10 Commandments and the precepts God gave and requires. 3) The ceremonial law: laws related to the offerings, sacrifices and rituals for worshiping God. Whatever we read in the OT, there is a direct connection to Jesus. The Prophets refer to the prophetic writings of the OT. These writings teach the law and they give instructions and encouragement for people to walk in obedience. Jesus came to carry out every requirement in the Law and to fulfill the instructions of the Prophets. He stated that he had come to be fully obedient to every part of the law and Prophets. 1. The OT is essential and remains until the end of the age. 2. Every detail in the OT and every word of the Prophets of the OT point to Jesus. 3. Jesus fulfills them all, obeying every command and expressing every truth. The Cross of Calvary is where the Law and the Prophets meet grace. When the fullness of time had come, God sent forth his Son, born of woman, born under the law. (Galatians 4:4 ESV) The God who gave us the law placed himself under it, which means that Jesus was required to obey it and carry it out in full measure. 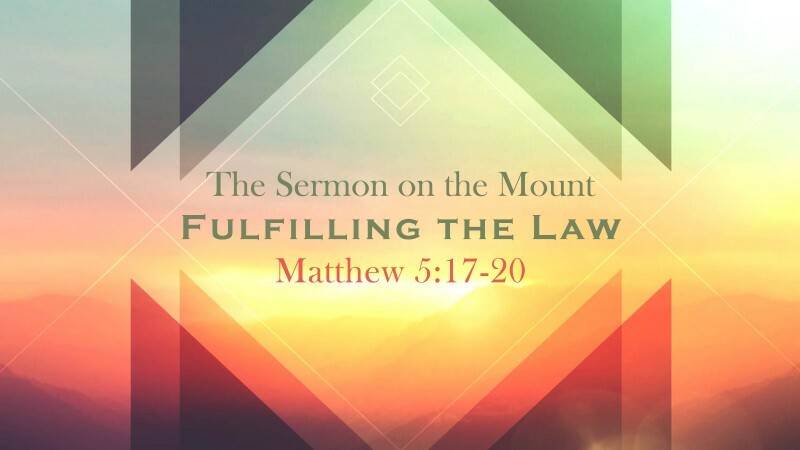 He obeyed the law with holy perfection. Whereas Jesus fulfilled the law, all mankind has broken it. All have sinned and fall short of the glory of God. (Romans 3:23 ESV) For the wages of sin is death…. (Romans 6:23 ESV) Jesus fulfilled the penalty requirement of law by taking upon himself the punishment due us because of our sin. The Holy Spirit enables those who are spiritually alive in Christ to fulfill the law of God. God not only fulfilled the law for us in Jesus, but he fulfills the law in us by the Holy Spirit. He does this by writing his law on our hearts and empowering us by his nature given to us and living within us.